In TwinCAT 3, the ladder logic editor shares a lot of functionality with the function block diagram editor. In some ways, the function block editor is just the ladder logic editor without contacts and coils. All of the function blocks available in the function block diagram editor are also available in the ladder logic editor, so I consider the ladder logic language to be a super-set of the function block diagram language. Ladder logic, however, requires the concept of a “rung”, which is just power (represented as a BOOL signal) entering from the left, and connecting all of the language elements together within the rung (a.k.a “network” in TwinCAT 3). While the novice programmer often assumes that a program with fewer rungs is better, the only thing that should guide your choice is readability. One good rule of thumb is that any instruction that modifies a variable should be the end of a rung. 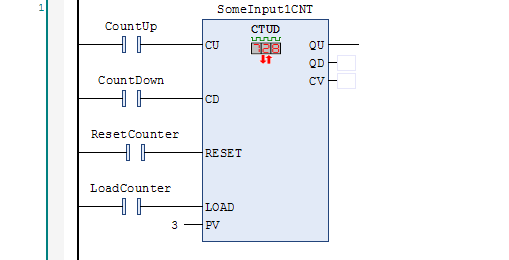 Ladder logic programmers implicitly assume that inputs are on the left and outputs are on the right. In the example above, the ADD instruction modifies the Result variable, so we should stop the rung there and continue the logic in a new rung. Everything on the left of the equals sign is the LValue and everything on the right is the RValue. The LValue is the part being modified (the result of the assignment) and the RValue is the expression being evaluated. It’s just that in ladder logic, this is reversed. The assigned variable (the coil) is on the right and the expression (the inputs) are on the left. What does this mean in practice? Basically it means that everything on the left of the vertical line will be evaluated first, and then everything on the right will be assigned. Only coils can go on the right, and coils can’t go on the left. That might seem a bit restrictive if you’re coming from Allen-Bradley, where you can put a coil instruction anywhere you like. In practice, this is only a minor adjustment to your thinking. Why didn’t it include an EN input and an ENO output when it converted it to ladder logic? As I said, the ladder logic language in TwinCAT 3 is a super-set of the function block diagram language. The ladder logic editor can support any valid function block diagram construction. However, this presents a problem. The ladder logic editor won’t allow you to connect the output of the ADD instruction to a variable. You can insert another empty box and use a GT (greater than) instruction to compare it, which gives you a BOOL output, which you can then connect to a coil. What you should be able to do is right click and choose Insert Assignment, but this option isn’t enabled in the ladder logic editor. I actually believe this is a bug in the editor, and that it might be fixed in a future version. In the mean time, you can actually build your network in the function block diagram editor, copy it, and paste it into the ladder editor, and it will compile and run just fine. To add an input, right click on the block and select Append Input from the context menu. Let’s take a look at the ladder logic specific instructions in more detail. The coil instruction does one thing: it assigns the result of the RValue expression (the result of the logic on the left) to the coil variable. In other PLCs, the coil instruction does a second thing: during program startup (sometimes referred to as the pre-scan), it sets the variable to FALSE. This is an important property of coils in ladder logic: they are expected to default to off after a program start. …will expect the Run coil to drop out if the program restarts (particularly due to the machine being turned off and back on again). If you make the Run variable persistent, then you will break this expectation. There is a principle of programming called The Principle of Least Astonishment. Don’t make a coil variable persistent because it breaks this principle. Use a Set/Reset instruction pair instead (explained later). Similarly, as a matter of programming style, do not use the same variable in two different coil instructions. The editor and compiler will allow you to do this, but it’s considered bad ladder logic style. If you find that you have logic that requires you to do this, consider writing that logic in structured text language instead. Ladder logic should mimic physical relays whenever possible, and using the same variable in two coil instructions breaks this mental equivalency. This is an example of an instruction that was probably included because it was easy to add, but should never have been included in the language. It’s easy to explain what this does: during program execution, if the rung input condition is TRUE, it sets the variable to FALSE, and if the input condition is FALSE then it sets the variable to TRUE. The problem is that there’s no real-world counterpart to a negated coil. The latter two-rung logic is the preferred form. Please avoid use of the negated coil instruction. One of the purposes of ladder logic is to allow electricians to debug it. The negated coil is not intuitive to an electrician and even an experienced ladder logic programmer will frown when they see it. In the physical world, we would use a latching relay. The latching relay has two inputs called Set and Reset (or Latch and Unlatch). Energizing the Set input will move an internal solenoid to change the relay to the “on” position. A spring mechanism will hold it in this position, so it will remember its state even after power is removed. Likewise, energizing the Reset input will move the solenoid the other way, to the “off” position. Note that in TwinCAT 3, to get the variable to retain its state, you will have to make it a persistent variable. The important thing to note is that when a ladder logic programmer sees a pair of Set/Reset instructions, they will expect this to be a persistent variable, so please don’t break this expectation. …sets the rung output condition to the logical “and” of the rung input condition and the state of the contact’s variable. In the physical world, a normally open contact is a switch that only allows power to pass if the coil variable is in the “on” state. The normal state of a coil is off (de-energized) which means a normally open contact is normally “open” (i.e. not conducting). …sets the rung output condition to the logical “and” of the rung input condition and the negated state of the contact’s variable. In the physical world, a normally closed contact is a switch that only allows power to pass if the coil variable is in the “off” state. The TwinCAT 3 ladder logic editor has a handy shortcut: to toggle a contact between normally open and normally closed, but select it and press the slash (“/”) key. Internally, the Positive and Negative transition contacts operate by implicitly storing a copy of the variable and comparing the current value against the value from the last scan to determine if a transition occurred. It’s worth noting that the internal variable copy seems to be initialized to FALSE on a program start. This means that if you use a Positive transition contact with a variable that is already TRUE when the program starts, the instruction will generate a pulse on the first program scan. This may be unexpected. For instance, if you have a persistent variable, and used a Positive transition instruction on it, and it was TRUE when the program shut down and restarted, most programmers wouldn’t expect the Positive transition instruction to generate a pulse when the program started. Unfortunately you need to be aware of this and program accordingly. If it’s important, you can use the built-in R_TRIG function block and make the function block instance itself persistent. This will save the state of the internal memory variable through the program shutdown and restart. A delay-on timer is more common, but a delay-off timer is typically used when you have a fast pulse (like a quick button-push or brief sensor) and you want to elongate that into a longer, more consistent pulse width. I find that most function blocks are declared in the program variables, not in global variables, though there are some exceptions. Where you declare them is up to you and the needs of your application. The count-up timer will start at zero (the CV output means current value) and will add one to the current value on each rising edge of the count-up (CU) input. The counter will turn on the Q output if the CV value is greater than or equal to the PV value. However, please note that the counter will continue counting even after the Q output is on. This is different than counters in some other PLCs. Turning on the RESET input causes the CV output to change to zero and the counter won’t respond to the CU input. Note that if you set PV to zero, the counter still functions but the Q output will always be on. As you can see, instead of a RESET input, the count-down timer has a LOAD input. When the LOAD input turns on, it sets the current value (CV) output to the value of the preset (PV) input. Each rising edge on the count-down (CD) input will decrement one from the CV output value. The counter will count down to zero, but won’t continue counting below zero (it can’t because the CV output is an unsigned variable). The Q output will turn on if the CV output is zero. Note that both the CTU and CTD counters are 16-bit counters (WORD variable), so their max values are 65535. You can, of course, write your own counter function blocks if you need one that can count higher. As you can see, you can RESET the counter (to zero), LOAD the counter (to the preset value) and count it up or down. The counter is “reset dominant” meaning if both the RESET and LOAD inputs are on at the same time, the RESET input takes priority. Like the count-up counter, it can happily count above the preset value, but like the count-down counter it can’t count down below zero. The QU output turns on if CV is greater than or equal to PV, and the QD output turns on if CV equals zero. Note that a purist would say that the value 25.4 needs to be declared in a constant, like INCH_TO_MM. Personally, for well-known conversions, I find that using the value 25.4 is simple and readable. Obviously you shouldn’t be using 3.14 for the value of PI because (a) it’s wrong(er) than than value available in the built-in constant and (b) the constant is shorter and more readable. If you really don’t want to use a constant, consider creating a function, like in_to_mm(). This is both readable, short, and precise. It’s also a very good idea to put the unit name in your variable name, such as Length_mm or Length_inch. In the United States and many facilities in Canada the operators will still want to see distances shown in inches, but Beckhoff motion control and servo products all use mm exclusively, so this type of conversion is commonplace. Putting the units in the variable name will help you keep track and make errors more obvious. The ladder logic editor in TwinCAT 3 is a powerful super-set of the function block diagram editor. It allows you to mix standard contacts and coils with the entire library of built-in function blocks, plus any new functions or function blocks you write. Remember to always focus on writing readable logic. In particular, make sure you’re writing logic that an electrician can read, follow, and understand. The ability for an electrician to understand ladder logic is one of the main reasons that we write in ladder logic to begin with. Always keep that in mind. This chapter is part of the TwinCAT 3 Tutorial. Continue to the next chapter: Writing your own Functions and Function Blocks.